Tattoo is a very ancient art which has been changed a lot during the thousands of years and still stays popular among people across the globe, including both the celebrities and regular people. Tattoos are the way to express your emotions, share your inner world and disclose your worldview. In addition, they are a great way to memorize important life events and symbolize your feelings or attitude concerning a definite phenomenon, object or person. 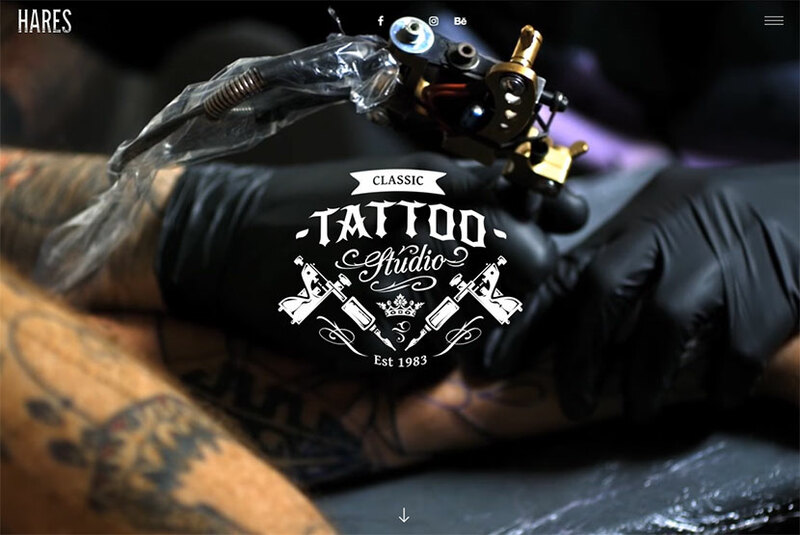 We’ve collected the best tattoo parlor and tattoo studio WordPress themes you can select either to share your personal works in your online portfolio or promote your tattoo salon. We also share some interesting facts from the history of tattooing, so enjoy and pick your best template now. Permanent ink-based pictures on the skin are called tattoos and considered to be a form of body art. Tattooing is a very ancient art which was known by folks around the world back in 3100 Before Christ. The mummies of people who lived and were buried thousands of years ago were found with tattoos on their skin, so this was the reason to consider tattoo art to be a very old one. 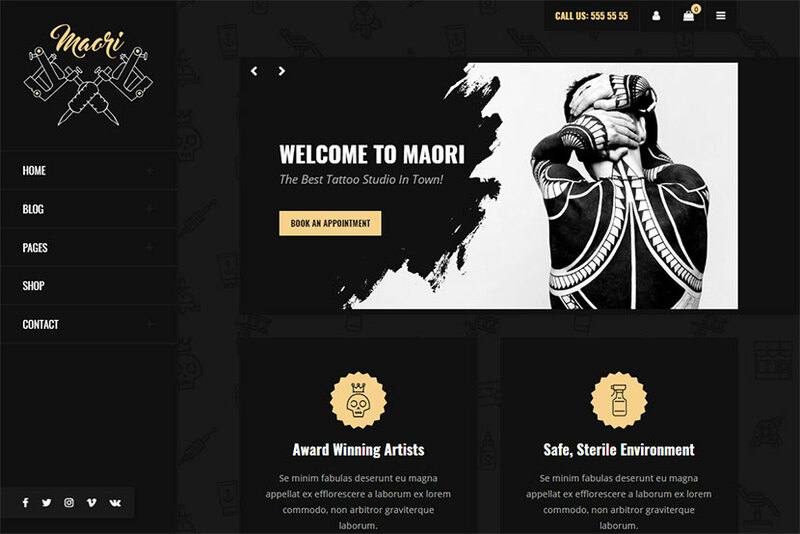 Maori is a dark styled WordPress theme designed for tattoo and piercing salon or studios that needs to create worthy presence on the Web. Initially the template comes with 4 homepage layouts and a wide selection of website building possibilities. Its features include translation support, SiteOrigin widget bundle plugin, classic, masonry, grid, and more blog layouts, as well as many more advantages. One of the most tattooed ancient mummies discovered 28 years ago was Otzi the Iceman. He was found in the Otzi Alps and this is why he was named like this. The Iceman is the oldest human mummy in Europe and his body was covered with 61 tattoos most of which were located on his legs. The pictures were examined and the conclusion was that the ink for tattoos was crafted of fireplace ash or soot. 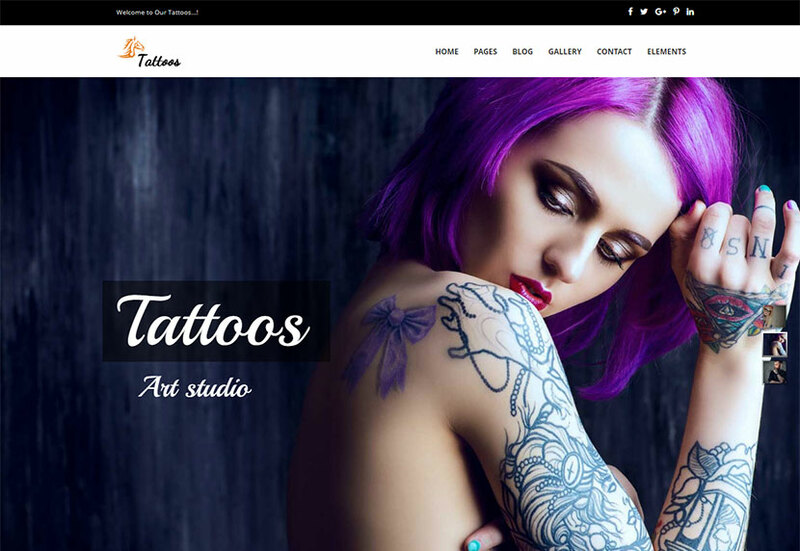 Dotwork is a tattoo art and tattoo studio oriented WordPress theme which comes with 3 pre-made homepage layouts including vertical showcase and portfolio ones as well as a number of inner-pages. WPBakery page builder, Revolution Slider, WPML support, Contact Form 7, and more premium plugins are pre-packed with the theme as well as a multitude of awesome features, so discover them now. The reasons behind tattoos are different and they depend on the location, worldview, culture, and more conditions. If we speak of ancient China, tattooing was considered to be the sign of barbarians and was highly disgraced. In Egypt tattoos were practiced to cure some diseases, for instance pelvic peritonitis. By the way, in ancient Egypt tattoos were made only by women. Helle is one more tattoo oriented WordPress theme which comes with 5 different homepage layouts as well as single-page and multipage styles. This template is going to suit for tattoo shop, piercing studio, tattoo salon or parlor, etc. Helle comes with working contact form, child theme included, and many more features pre-packed. In such country as Samoa tattoos were the part of social culture for thousands of years. There is a belief that a modern term ‘tattoo’ has been originated from Samoan word ‘tatau’ which means tattooing. Tattoos in Samoa were made with a handmade tool crafted of turtle shell and boar’s teeth. The process of receiving a tattoo was very painful and if a person wasn’t able to endure the pain they were burnt with a stamp of infamy. 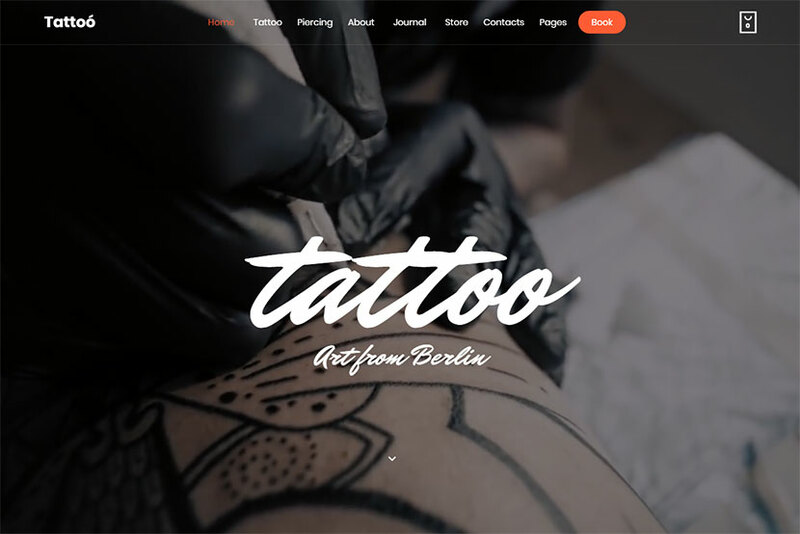 Tattoos is one more cool WordPress template which comes with 3 homepage layouts including the ones with a slider, image and video. The theme is based on Unyson framework builder, includes Revolution Slider plugin, WPML localization support, well organized, commented and clean code, advanced theme options, newsletter compatibility, and many more features. In Greece tattoo was known since the 5th century BC. In ancient Rome and Greece tattoos were used to brand the status of the outcasts in society, so they were made by criminals and slaves. Roman slaves received tattoos to show they had paid their taxes. By the way, some ancient Rome soldiers and manufacturers of arms also had tattoos on their bodies. 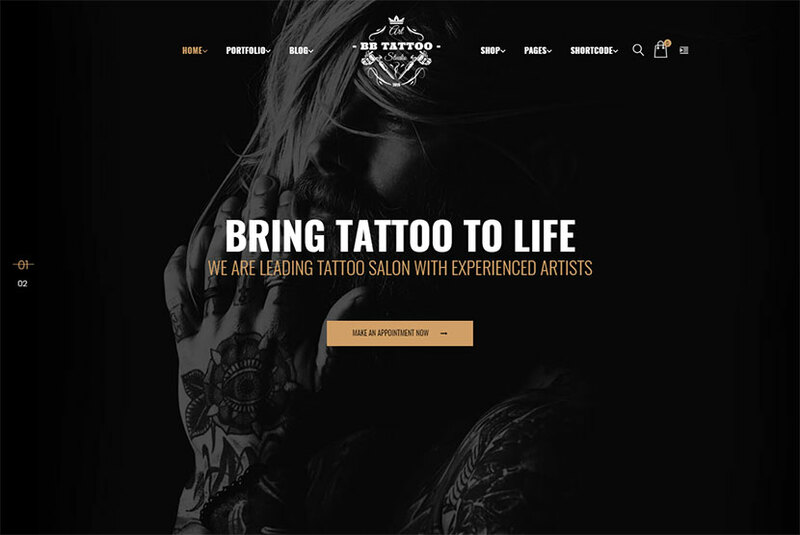 Scala is a multi-concept WordPress theme available with 20 homepage demos including the one devoted to the art of tattoo. Parallax header background, unlimited colors, customizable pre-loader options, 35+ shortcodes, WooCommerce functionality support, header, slider, footer and more options for every page, animation blocks, and many more features are pre-packed with the theme. In the 20th century the styles of tattoos were changing almost every decade. If we speak of the beginning of the century, the tattoos were popular among sailors and circus performers. People made the ink pictures on their skin to share some events from their lives or indicate their profession. Sailors made the tattoos to symbolize the amount of miles they had crossed or depict the countries they traveled to. 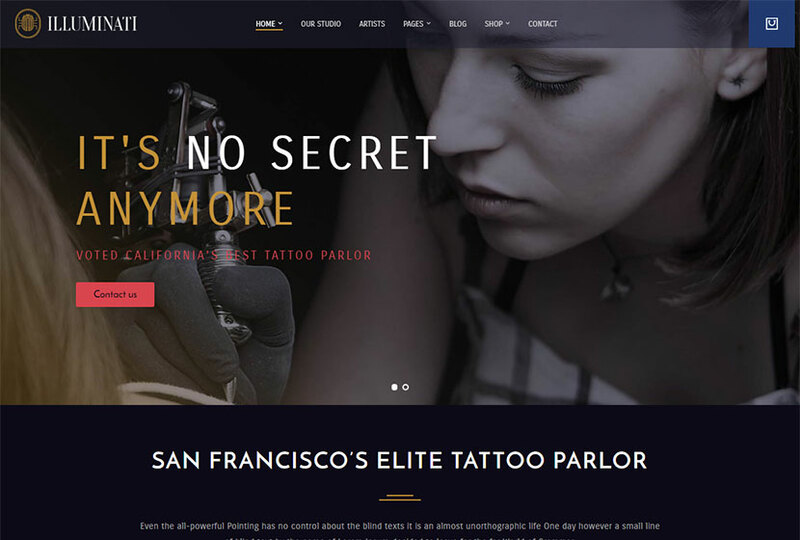 Tattoo is one more modern WordPress theme appropriate for tattoo and piercing salon out there. It comes with 4 homepage templates and three inner-page layouts as well as 10+ portfolio variations. 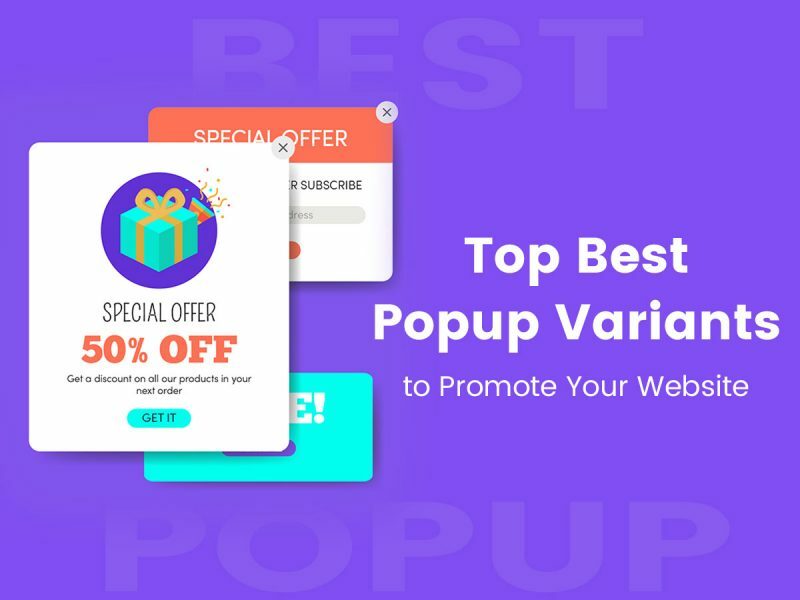 It includes both dark and light versions of homepage design and has a multitude of useful features like WPML compatibility, WooCommerce integration, video background sections, etc. The 20’s were the years when permanent makeup became popular among women. Such tattoos were made to highlight the eye shape, make a form of eyebrows more visible and correct the lip line. This decade was the time when traditional tattoos weren’t acceptable in the society and were mostly made by criminals, sailors and circus performers. Fortunately, this stereotype has started to be changed with every next decade. 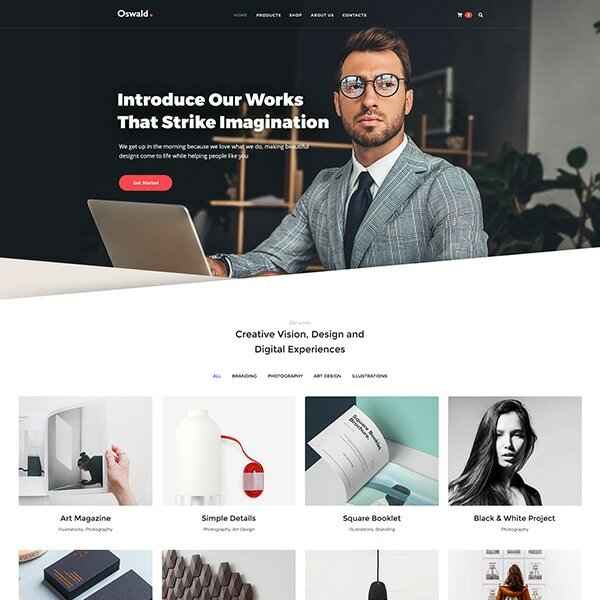 Hares is a multipurpose WordPress theme which is mostly suitable for tattoo parlors, barber shops, breweries, biker clubs, pubs, v-cards and even fishing websites. The theme includes 15 homepages available with different design styles as well as appropriate for absolutely varied businesses and activities. Plugins like WPBakery page builder and Revolution Slider, features like online shop functionality, mega menu, unlimited color options, and much more is available with the theme. The 30s years of the 20th century were the period when social security numbers appeared. Every person was told to remember their personal number, so many people started to tattoo their social security number on their bodies. After the release of Albert Parry’s book there was a belief that tattoos symbolized the suppressed sexual desires, so they were not socially accepted. 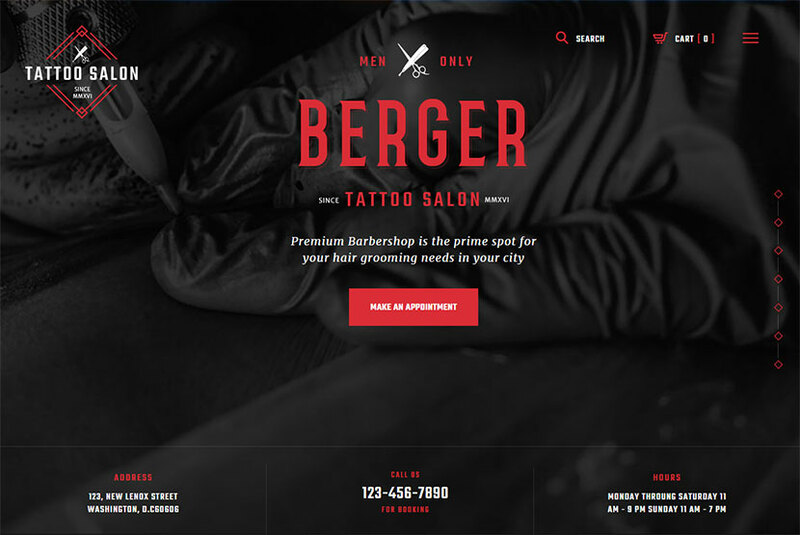 Berger is a tattoos and barber shop oriented WordPress theme which comes with two homepage layouts designed for two different purposes and available with beautiful dark skinned styles. The theme is based on WPBakery page builder, comes integrated with Revolution and Swiper Sliders, user and main menus, custom widgets and shortcodes, WPML support, and many more features. The 40s were the years when tattoo art was mostly focused on military and marine motifs. This was the time when American tattoo artist Norman Keith Collins also known as Sailor Jerry established his own tattooing style which supposed the use of color. His custom made pigments were added to his own tattoo designs and this was the start of a new tattoo era. The popularity and social acceptance of tattoo has finally started. 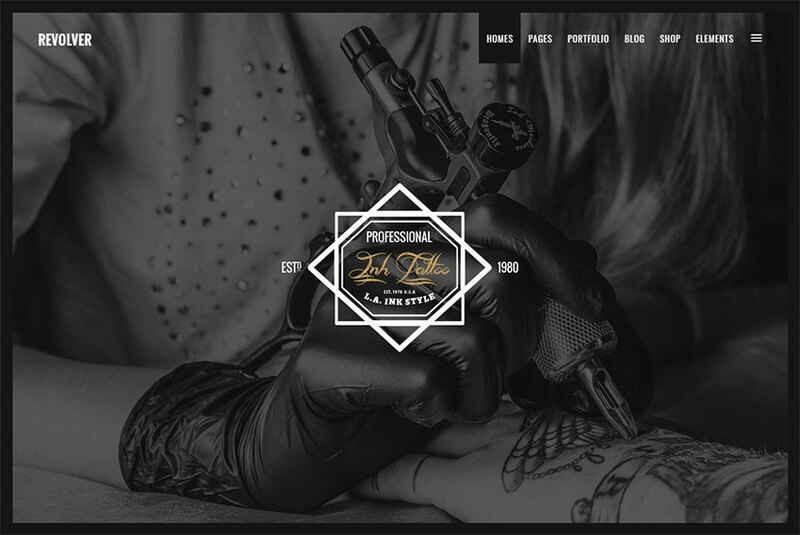 Tattoized is a creative WordPress theme specifically made to meet the needs of independent tattoo experts as well as body art, piercing and tattoo studios out there. The theme has been built with Power drag-and-drop page builder, includes different header and footer settings, pre-configured inner pages, comprehensive gallery, multiple layout options, convenient search functionality, and much more. In the 50s the tattoos were mostly made by men and were the symbol of manhood. Unfortunately, this decade was the period when tattoos have gained negative social attitude again. However, the 60s have brought some tattooed musicians who became the idols and even so-called stars to steer by. Because of the Vietnam war, patriotic tattoos also became popular. By the way, a well-known skull with crossbones tattoo became recognized among bikers. Illuminati is a tattoo parlor WordPress theme which comes with 3 homepage layouts including the ones with a hero image and a slider. It comes with a tremendous amount of inner pages including the shop templates, portfolio and profile layouts, blog, and many more ones. Iluminati integrates with drag-and-drop page builder and Revolution Slider, includes unlimited colors, comes with eCommerce support and has many more useful features. The 70’ made tattoos real mainstream. This was the period when lots of people made tattoos on their bodies, and peace symbols were the most popular pictures for this type of body art. Full sleeves and bodysuit tattoos started to appear in the 70s, and many young people were addicted to them. This was the time when people felt the inner freedom which they expressed through their tattoos which started to be positively treated in the society. 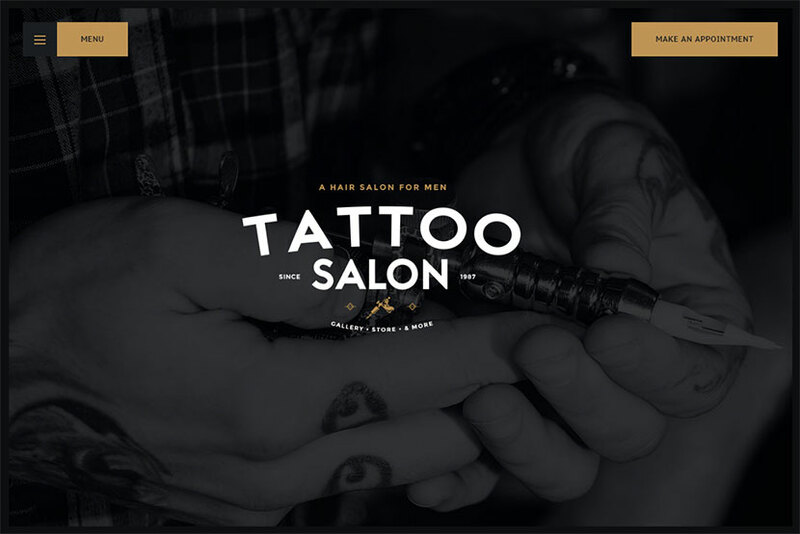 Salon is a great WordPress theme which will both suit for a tattoo salon and a barber shop. It comes with a light homepage version for a barber shop and a dark one for a tattoo salon. The template includes Online appointments booking and management solution, Essential Grid, Events Calendar, WooComemrce support, WPML localization compatibility, fullscreen pushing navigation, and many more features. The 80s have made tattoos much brighter and larger, black bold outlines and Celtic knots were often seen in the ink-made body pictures. Rock-an-roll performers also started to make tattoos, both black and colorful ones. Of course rock idols inspired people to get inked, so lots of rock music fans resolved to “wear” tattoos and finally they have become socially acceptable. 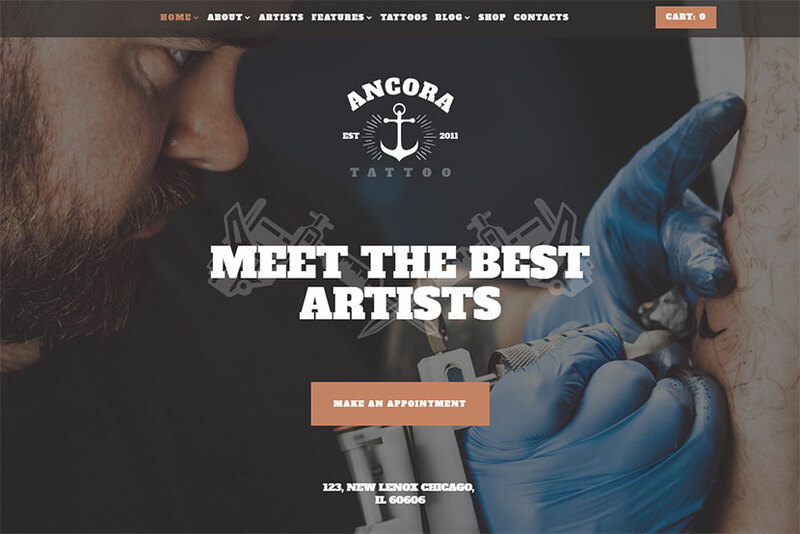 Ancora is an urban tattoo salon and ink shop WordPress theme which comes with 4 homepage layouts including wide and boxed styles, ken burns slider and static hero image ones. The template includes multiple features like online appointments booking and management, advanced contact forms, great premade inner pages such as about, services, artists, and more, nice gallery and post layouts, WooCommerce support, etc. In the 90s even more celebrities were inked and made tattoos be the fashion trend. Popular pictures of this time were Chinese characters, armbands, tribal designs and the sun images. Tattoos placed on the lower back started to be popular in the beginning of 2000s. Butterflies, flowers and Yin-Yang symbols were often chosen by women to get inked. 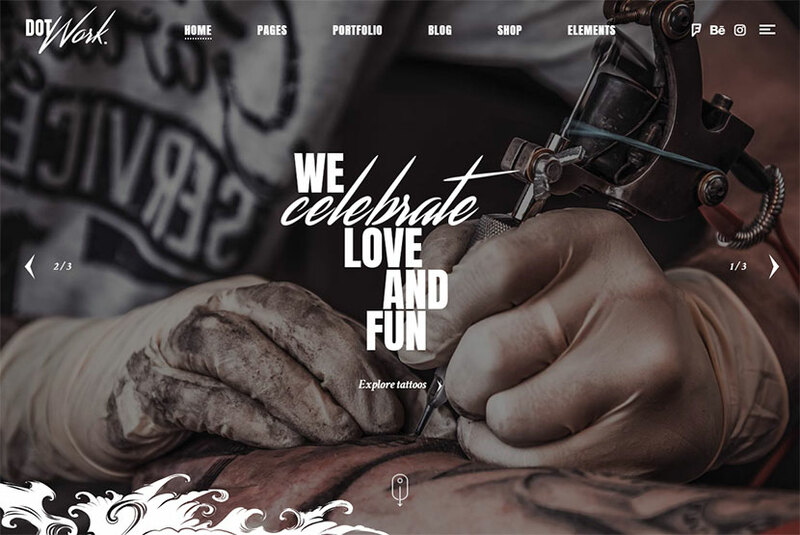 Revolver is one more cool tattoo studio and barbershop WordPress theme which comes with 6 homepage layouts including the ones suited for a pub, biker club, tobacco store and a regular shop. 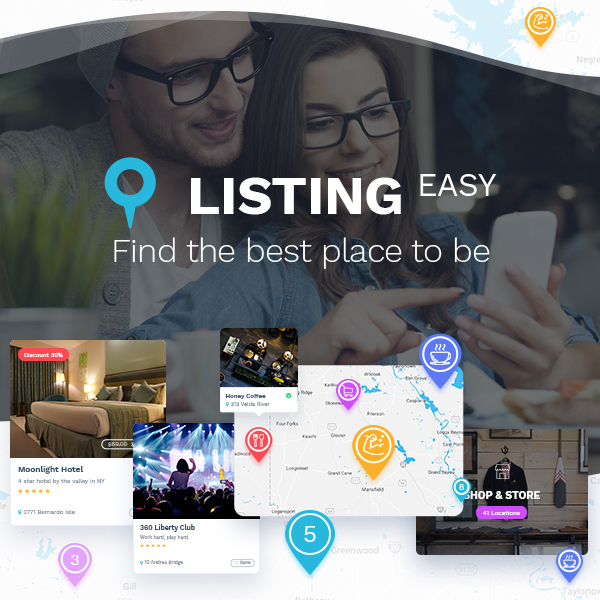 The template comes with easy-to-use powerful admin interface, Edge Slider with image, parallax effect, zoom animations and video support included, 3 header types, a collection of custom shortcodes, and many more features. Since the 2010 and up to now the tattoo trends slightly change depending on the placement, design and size of tattoos. Small tattoos in unusual places, full sleeves, bodysuits, big tattoos, colorful and black tattoos – people select very different pictures no matter they are in trend or not. Today the tattoo is a way to express your personality, share your worldview, or just symbolize your inner feelings and emotions. Barber is a hair, tattoo and beauty salon WordPress theme which comes with 13 homepage layouts and many more ones coming soon. The template supports both WPML and RTL multilingual feature, mega menu, 50+ pre-defined inner page layouts, unlimited color options, WPBakery page builder with Ultimate Addons and Revolution Slider integrated, MailChimp newsletter, Contact Form 7, salon booking system, 15+ layout options for blog pages and 6+ layout options for portfolio pages, and much more. Modern day tattoo equipment supposes the use of electric tattoo machine which was first patented by Samuel O’Reilly. This machine’s design is based on the electric pen crafted by T. Edison and a bit modified today. Black ink for tattoos was made with iron oxide or carbon, and if we speak of red, yellow or orange ink, it was mostly made of cadmium components. Organic pigments with filters and binding agents are more commonly used in the 21 century. 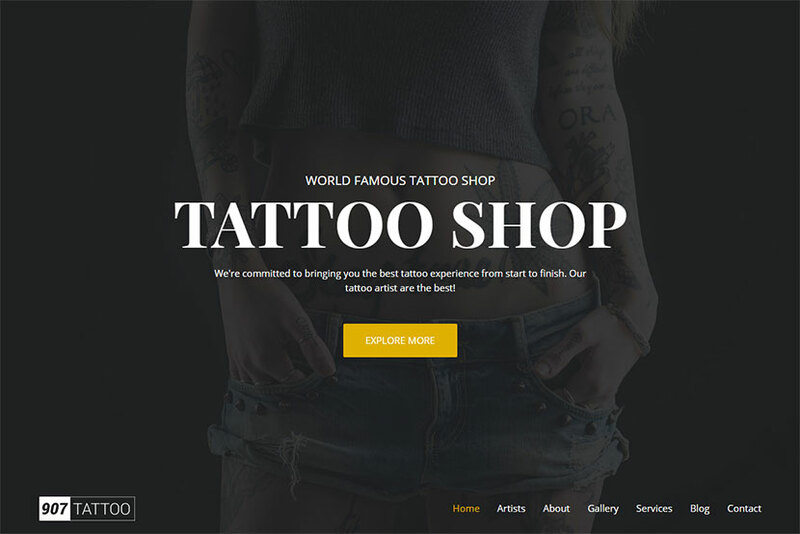 907 is a multipurpose WordPress theme which comes with 23 one-page and multipage demos including the one devoted to tattoo shop. 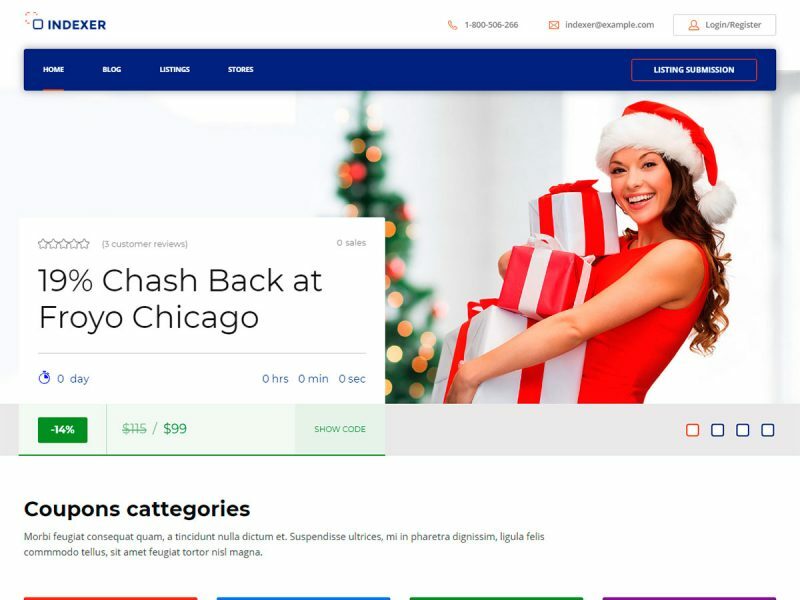 The template is based on WPBakery page builder, comes with parallax and video backgrounds, full width menu bar, WooCommerce support and ajax pagination, lazy load video background, Slider Revolution, boxed and fullwidth layouts, as well as many more advantages. And what is your attitude to tattoos? Do you like them or have you got one? Please share. Thanks.